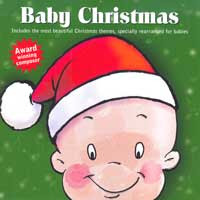 At any rate, I was approached to do a review of two CDs from Lovely Baby: Baby Christmas and Baby Christmas 2, both by Raimond Lap. Baby Christmas (cover photo above) description: Finally, Christmas music created just for babies. No longer do you have to settle for those irritating holiday collections dressed-up to look like music for your baby. Put that bad music box music out with the fruitcake! Lovely Baby creator, Raimond Lap, has come up with a wonderful collection of holiday classics (plus four originals) that will thoroughly please the little ones while entertaining the entire family, bringing the magic of the holidays into your home. So cozy up with your baby by the tree and cherish these special moments. Baby Christmas 2 (cover photo above) description: Lovely Baby is the only original music series in the world specifically created for babies, prenatal to 36+ months. They help with their emotional, intellectual and social development. The series was created by Dutch composer and international baby music expert, Raimond Lap. Lovely Baby CDs are used in elite infant education programs around the world, including those of the U.S. military. I enjoyed both of these CDs, even though I don't have Babies anymore, and I must say that my children enjoyed the music too. My son wanted to act like he didn't because he's 13 but did get into the music about halfway through our listening experience! Who can resist Christmas songs?! No one! TWO of my readers will win a copy of Baby Christmas 2! Fine print: This giveaway is open to residents of US & Canada and will close at midnight on 12/15/09. Winners will be announced here at A Simple Kinda Life and will be emailed. Winners will have 48 hours to respond to my email or will forfeit their prize. I would love to win this for my daughter, who, at 15 months is still a baby, but she doesn't really seem like it anymore! I have to say, it sounds interesting. I downloaded a song from the site, and it is cute. Cute songs! My boys would love it, they love music. My youngest especially loves to sing and dance. This would go to my two little grandsons who love music. i'd give this to my new nephew, soundas so cute!